Bean Around Town: It's NYE! Horizontal stripes don't exactly flatter, but here I am modeling my best home made Christmas gift. I was given this pair of PJs by my mother. She sewed them for me, isn't that sweet? Just like when I was a little girl. She said if I laughed at the gift, she would never make me anything again. So, to make sure she makes me more lovely things, I sent her a series of silly photos by email to show her how much I appreciate them. Remember this post when you next make something for your kids. Even years later, it will be appreciated. Nothing says lovin' like a home made present. This is the only photo I dare publish here, in part because it is hard to detect my face. I do have some pride! The other photos were increasingly silly. I am a bit of a ham, I'm afraid. As I get into my thirties however, I try to keep that for my immediate family and have some decorum in public. 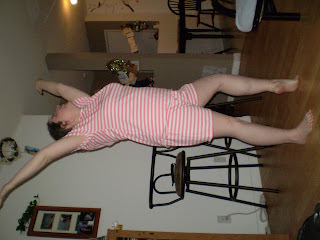 I am after all in my PJs, not to mention the fact that the stripes did nothing for my derriere, if you know what I mean. Perhaps I have had a few too many holiday treats. Nah, that couldn't be it. Here's to New Year's fitness resolutions. Thanks Mom, for reminding me with the stripey leisure suit, ha ha. Oops. No I wasn't laughing at you, I was laughing with you. Incidentally, I have no idea how to flip the photo horizontally, I will work on it later. Just tilt your head for now, unless you want to comment and tell me how to do it! Happy New Year! All the best to you and yours in 2010! You can call me Martha.